This is one of two pages about quantities in cooking. It describes the relationships between the “medium onion” and what it really means in practice, and also relationships between various forms of the same items. The other page	describes problems of weights and measures. Typical recipes use vague formulations like “a clove of garlic”. Which of these is the standard clove? Clearly it's not the big one or the small one, though the small one isn't as small as they can get (I've seen some weighing as little as 0.6 g, only 2% of the weight of the big one). But is the one in the middle correct? 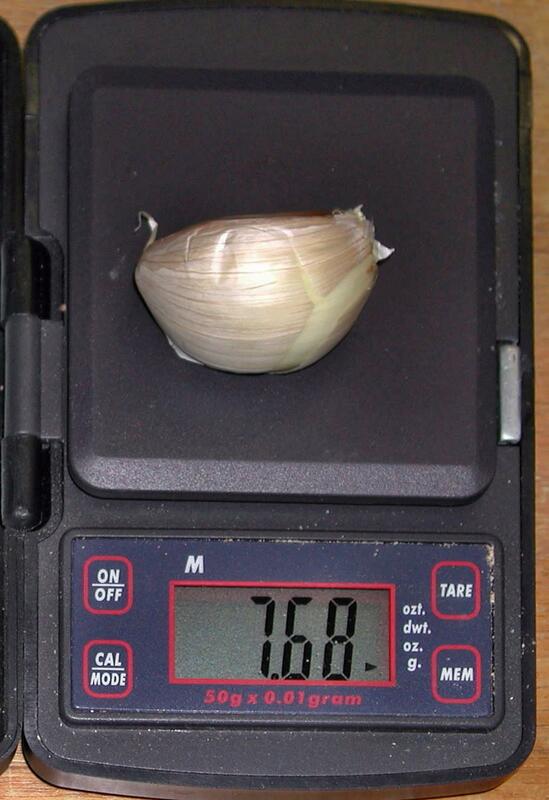 The average size of a clove of garlic depends on the locality. There's an answer that is simple, accurate and useless: “it depends on what the writer of the recipe was thinking”. Divine that and you'll get the results you want. Alternatively, go by weight. This is the reason that I specify things in weights. Sometimes this looks overly pedantic, but the real point is that I'm just recording what I do, especially when I'm experimenting. If I don't know what I did last time, there's no way to improve on it the next time. What do you do when you see a recipe asking for “3 medium onions”? 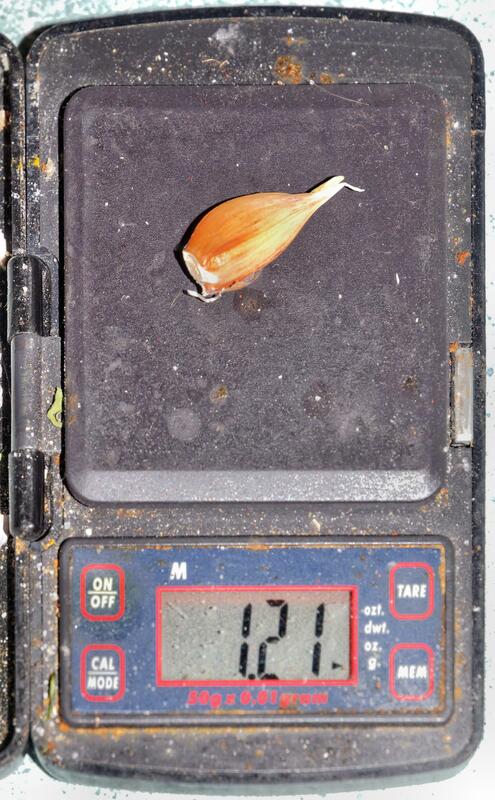 Onions vary in weight as much as garlic: they can weigh between about 20 g and 1 kg. What's the happy medium? I don't know, and if I didn't have to read cookbooks so often, I wouldn't care. But here are some empirically derived weights for things I use, in some cases based on measurements, in others on guesswork. 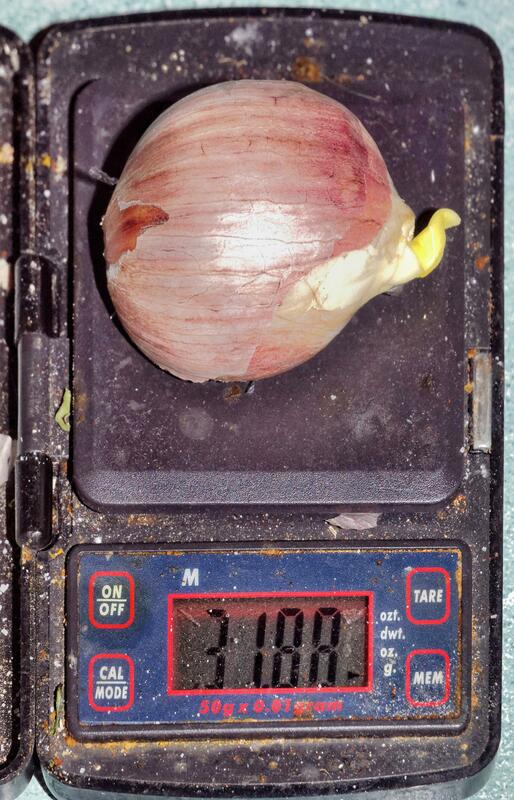 When I wrote this page, I put the ”medium onion” at 100 g. Now I'm saying 160 g, simply because that's what my onions weigh on average. I have no idea if that's typical. If you have any input, positive or negative, I'd like to hear it. Note the weights of spices: whole spices can't be heaped as much as powder, so a “tablespoon” of whole spices tends to be about 3 “teaspoons”, whereas for ground spices the factor is about 4 to 1; yet another reason not to use volumetric measures. Note also the big differences in weights for different spices. In some cases, weighing doesn't make sense. A stick of cinnamon weighs between 1.5 g and 2.5 g; if you get a recipe asking for 2 g cinnamon, and your sticks weight 1.5 g, are you going to take one and a third? Probably not. In this case, where the sizes are pretty uniform and the exact quantity not very important, traditional measures are good enough. A number of foodstuffs are available either dried or fresh, such as mushrooms and chiles. I'm starting a list here of the relative weights. Think of the values as factors or weights.